Decorist designers seem to be everywhere these days. A handful of our talented team recently participated in the West Coast’s premier design showhouse event, the 2016 . Each year, a select few of the region’s top interior designers are chosen to participate by designing a room in their signiture style. 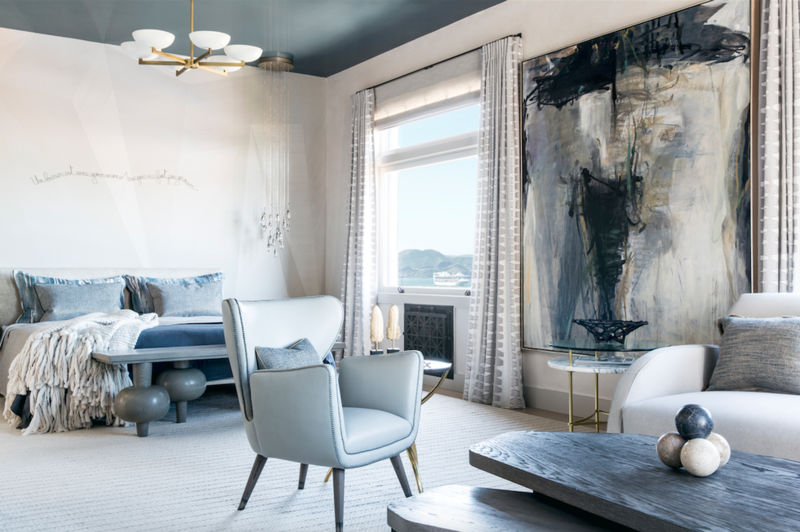 This year’s setting was a stunning residence situated on Telegraph Hill, featuring dazzling views of both the Bay and Golden Gate Bridges, with Alcatraz Island off in the distance. If you didn’t have the good fortune of being in town to attend the month long event, we’ve got you covered. With five of our illustrious designers participating, we have a stockpile of photos and lots of designer insights to share. Take a peek and prepare to swoon a little (or a lot, like we did). Choosing an altogether minimalist, eclectic approach, Antonio Martins chose the recent renovation of San Francisco’s SFMOMA as the point of departure for his thoughtfully-edited and cutting-edge Showcase gathering spot. Following this theme, white lacquered walls, rolled steel floors, and white draperies were used to create a gallery-like setting. Museum-quality art by Bay Area leading artists carried the concept of a true collector and visionary. With his international and commercial design background, Antonio is fully at home decorating on a grand scale, even in a smaller room setting. An artist at heart, his work here exudes originality and simply feels important. 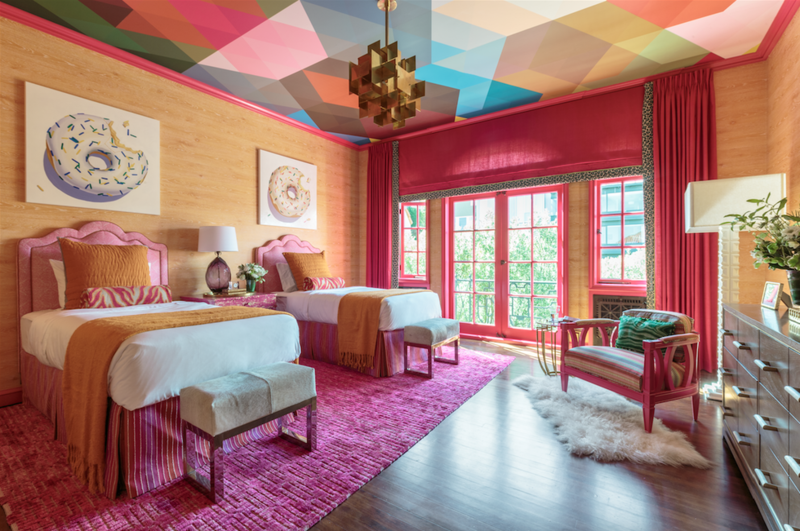 The illustrious Annie Lowengart created a technicolor dream bedroom for a teen girl with artistic leanings. Symmetry was a central theme from the kaleidoscope-inspired ceiling graphic to the twin beds with matching modern benches. Earth tones effortlessly harmonize with brights and jewel tones for a rich color experience. Ann specializes in creating warm, chic, inviting interiors that complement the architectural style of a home. She’s a master at creating mood and drama, but has pulled it off with a lighter, whimsical vibe, so perfectly appropriate for an adventurous teen. A rustic sophistication in keeping with the gorgeous rugged views was the building block of the sublime master bedroom suite. Designer Tineke Triggs, who knows her way around a luxe room landscape, opted for a cool palette of soft blue-grays and muted taupes to create a mood that is reflective and dreamy. Touches of glam always find their way into Tineke’s interiors and original art, including dimensional art objects, play a starring role. 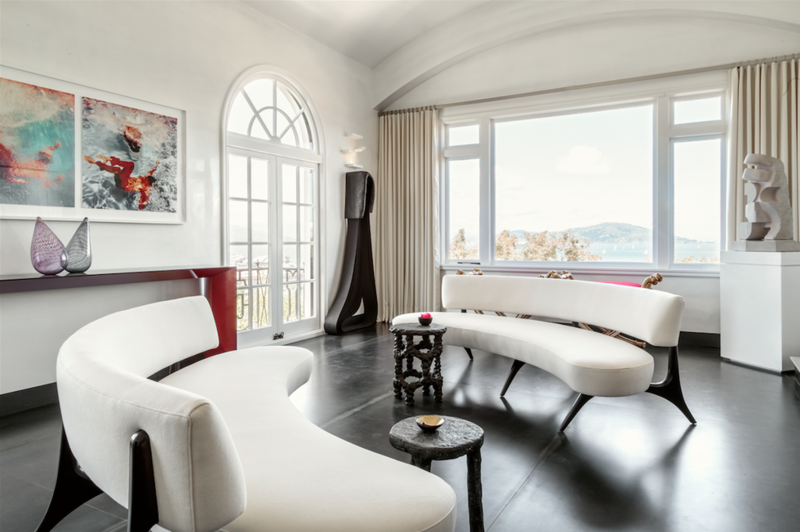 Shapes in this space are soft, curved and earthy, which create a balanced counterpoint to the masculine color palette. A yin-yang win-win. 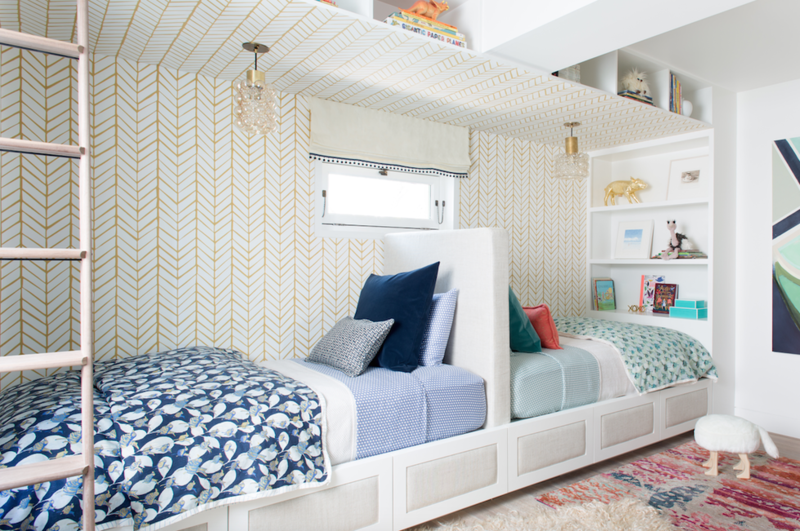 Shared Little Boy's & Girl's Bedroom — Elite Designer Nest Design Co.
Design powerhouse, Nest Design Co., infused delightful storytelling elements into an impressively cohesive shared boy and girl’s bedroom. With twin beds forming mirror images of each other, they were able to create more privacy and opportunity for individual expression without losing the seamless, sophisticated style. Nest’s design philosophy is about coming home to a place you love. A place that’s inspirational, comforting, and allows you to breath and grow. It’s safe to say they did just that in this fresh, playful space. 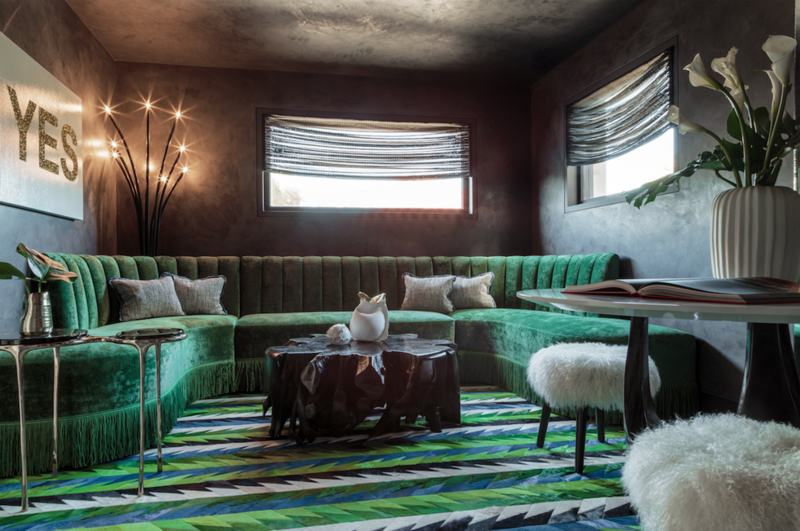 Aptly dubbed “a sophisticated salon,” design duo Evars + Anderson went out on a far-reaching limb to create a lounge space that oozes an unexpectedly groovy glam. Period furniture, unique deco, and touches of midcentury design, create a vintage-inspired melting pot that’s adventurous and fun. Not for the design-shy, the Showcase salon hits all the right notes in its San Francisco setting. Evars + Anderson’s affinity for mixing objects of different styles and eras is on full display in this modern take of an old-world room concept. The salon is enjoying a pretty major rebirth right now and we’re loving every square foot of it. We hope you enjoyed this irresistibly chic design from the SF Designer Showcase as much as we enjoy working with this amazing crew. Feeling inspired? Work with one of these 5 - or any one of our other talented designers - to make over a showcase-worthy room of your own.